I placed an order for three products on April 4th. On April 16th, a full twelve days later I had still not received my products and tracked the product to see where it was. The tracking link I was given was invalid. So I called the company to find out what happened. Ok, I explained to her that at this point I was almost out of one of the products, Ubiquinol, and it was important for me to take this product twice daily to control the kidney disease I’ve been blessed with. I had only one day of product left. She promised me that a replacement would be sent out, and would arrive on Thursday the 18th, two days later. I asked if it was possible if she could overnight the product to me, and I was told that no, that was not possible and I would have to wait for the second day shipment. So I accepted the second day shipment with the understanding that it would arrive thursday. I asked again, “are you sure that it will arrive Thursday?” She confirmed that with me, and also promised that the other two products would come in “in a day or two” and be shipped second day as well. So what happens on the 18th? I check the tracking link and it says the package will be delivered on Monday the 22nd. So again, I call the company and speak to Lisa this time. She explains that Maria did in fact request second day shipping but it wasn’t shipped second day. It was shipped ground, and someone screwed up. “Yes indeed”, I said, “someone screwed up, and I need someone to do the right thing here. Can you please ship a replacement overnight, so that I don’t have to wait 18 days for this product to arrive? I will ship back the second product when it arrives on Monday, but I need it because I am now out of Ubiquinol.” I also again explained that I have Kidney Disease, and that this is an important supplement for me. She explained that a supervisor would have to ok an overnight shipment, and the supervisor would call me back right away. I left my phone # and waited for the call, and waited for the call, and finally realized there was no call coming. After placing numerous orders before at over $100 per order and being a customer for quite some time, I was unable to speak to a manager and no accommodations were made when their staff made an error. No measly $5.00 credit no expedited shipping no extra samples no nothing. After contacting Lisa via email and asking to speak with a manager because I was dissatisfied, I was refused and no attempt was made to go above and beyond for me due to their mistake. Disappointed and you can even get a manager to speak to you. Amazed. Buyer beware – don’t be fooled with free products and low prices! Shipping cost are high especially with free products. Shipping came out to 23 dollars and two products that totaled 20 dollars. For that shipping cost you would expect speedy shipping and good service. ..wrong! I called customer service find out where my order was since there wasn’t even a tracking after 4 days. After waiting on hold for over 20 minutes service said that they don’t have the info and would call me back which they never did. After finally receiving on my 23 dollar charge I found my product was due to arrive 13 days after placing the order. Spend more for your products from another company and it will be cheaper overall and you will receive your product a week sooner. Order was put in over a week ago and still has not shipped. Contacted their help desk and asked for some explanation, considering their site says most orders are shipped same or next day. I was told sometimes delays happen for various reason. It was like they didn’t even look at my order to see what was going on, just gave me a generic reason as to why it hasn’t shipped. That was two days ago, it still hasn’t shipped. What a joke so unhappy! I don’t know where these people live that are getting such fast shipping! I have been ordering my supps online the better part of a decade and I’ve never had such a terrible experience! …By the way there is such a thing as free shipping and its prompt too! I’ve never paid for shipping and never waited longer than three days four at the most! And with much larger orders I might add! Not including the two full weekends it will total seven days I’ve waited! So I saved five dollars in the end and waited twice as long Thanks but no Thanks the FIRST AND LAST SUPPLEMENT WAREHOUSE ILL ORDER FROM!!!! But that wasn’t the worst of it. There were three Facebook comments of the same variety posted on Tuesday. By Wednesday, they had mysteriously disappeared from the Supplement Warehouse Facebook page. That’s right, the company deleted all their negative comments. I have never seen that before. I thought that said it all about this company, but I was wrong. It gets worse. Check out this link about Supplement Warehouse, and this link too. Oh boy! This is like an expose at this point. Need I go on? 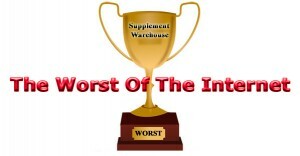 So I give you our first winner of the “worst of the internet” award…Supplement Warehouse. To all you scammers out there, be on notice that you could be next!